Image via BMW, modified by the author. Some say the BMW M3 of the 1990s was a bit of a crap can, impure and unworthy of the “///M” badge. I happen to think it’s a handsome looking car but any way you slice it, there’s no denying the European spec version was superior. This video breaks down how. 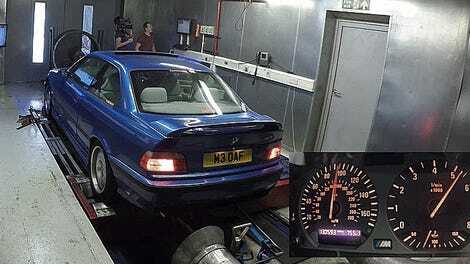 Euro-spec E36 M3 owner Alex at CarThrottle has been entertaining us with interesting real-world tests of his car’s power and top speed. His recent videos have actually made me like the car even more, until today when he just had to go and explain exactly how much lamer the U.S.-spec version of the car really is. Just kidding, I still dig its simple slabbiness. But this video was pretty educational for me. 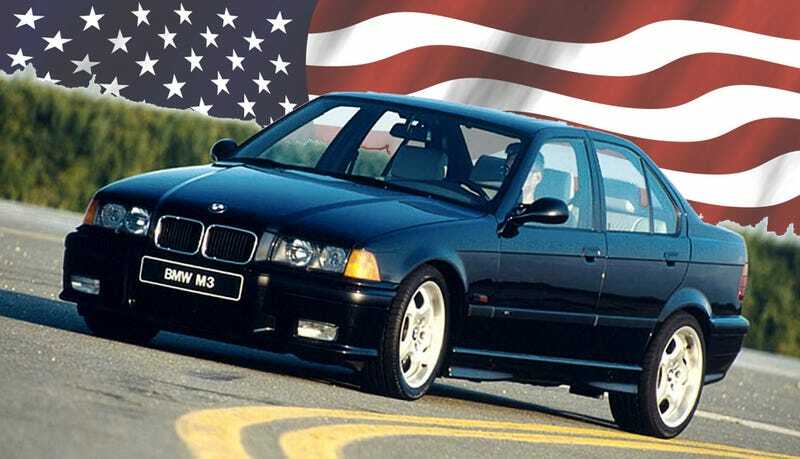 Alex starts by saying the U.S. market wasn’t supposed to get the E36 M3 at all, and it only ended up here as a result of a successful campaign by the BMW Car Club Of America. I am skeptical of this and still think there’s more to the story, but prevailing lore does seem to largely credit the Club with the E36 M3's introduction in this country which came two years after the European intro. Anyway the car came here eventually, with the same 3.0 liters of displacement as the European version. But the engines are not the same. Alex explains that the Euro car runs individual throttle bodies and BMW’s continuously variable valve timing system (VANOS) to make 286 horsepower and 336 lb-ft of torque. The U.S. version ran a single throttle body, had lower compression, a less advanced version of VANOS and was generally somewhat neutered apparently to meet American emissions regulations. Our version was rated to 240 horsepower, and a meager 225 lb-ft of torque. Alex goes on to say the U.S. car’s best 0-60 time stands at 6.1 seconds, while versions of the Euro M3 got down to 5.5. Other than that the E.U. car only had a beefier rear differential, better brakes, higher-quality headlights, a higher speedometer and headlight washers which Alex seems to be pretty taken with. I still say you’re wrong to call the American E36 a “bad car.” But it sure does look like the European E36 is a better car. At least it’s eligible for import per 25-year-rule soon, right?